How do you celebrate a successful decade as a music recording artist and interpreter? You present your best known songs with new acoustic arrangements in an intimate format for your fans. 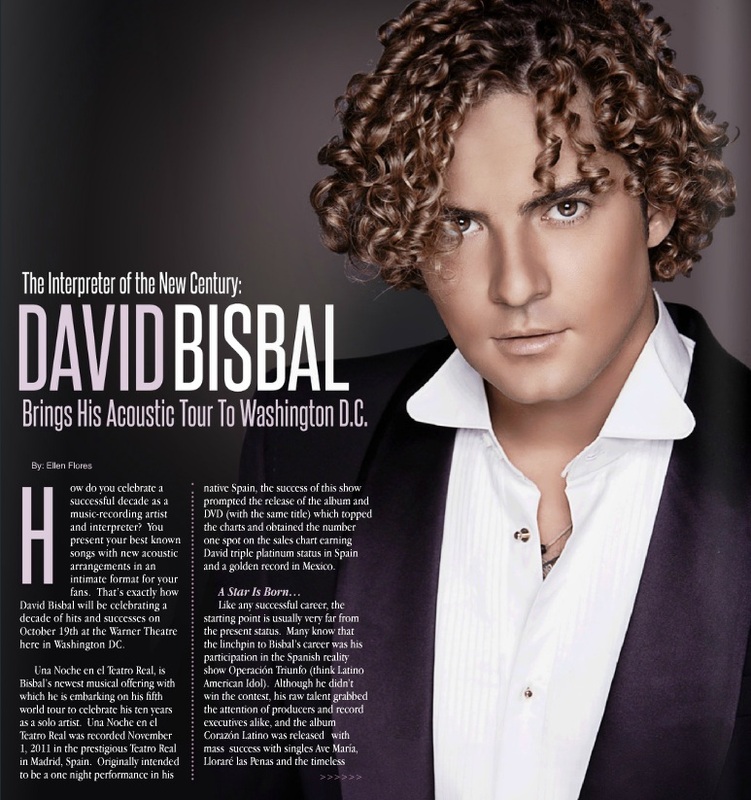 That’s exactly how David Bisbal will be celebrating a decade of hits and success next month at the Warner Theatre here in Washington D.C.
Una Noche en el Teatro Real, is Bisbal’s newest musical offering with which he is embarking on his fifth world tour to celebrate his ten years as a solo artist. Una Noche en el Teatro Real was recorded November 1, 2011 in the prestigious Teatro Real in Madrid, Spain. Originally intended to be a one night performance in his native Spain, the success of this show prompted the release of the album and DVD (with the same title) which topped the charts and obtained the number one spot on the sales chart earning David triple platinum status in Spain and a golden record in Mexico. Like any career, the start point was one very far from the present status. Many know that the linchpin to Bisbal’s career was his participation in the Spanish reality show Operación Triunfo. Although he didn’t win the contest, his raw talent grabbed the attention of producers and record executives alike, and the album Corazón Latino was released to the mass success of the singles Ave María, Lloraré las Penas and the timeless and crowd favorite Dígale. Following Corazón Latino, David released a subsequent series of albums that opened doors across the globe. Bulería (2004), Premonición (2006) and Sin Mirar Atrás (2209) were his follow up studio productions. Throughout the years, David Bisbal has grown as a performer. He is regarded as a powerhouse voice within the current Latin Pop genre. Reminiscent icons like Julio Iglesias and Luis Miguel, and of the electricity they generated with thousands of fans -mainly female- David has managed to grow and develop a stage persona that is able to connect deep within the listener’s core. More than a singer, he is an interpreter; a skill that in today’s current music panorama, seems to have been lost in favor of auto-tune technology and overnight You Tube sensations. To perform a song is no easy task, but to be able to interpret and deliver the raw emotion that lyrics and melodies combine is a gift that not many people have. If for no other reason than that, he has earned the respect of many artists and skeptics that once brushed him off as a “reality show flavor of the week”. His vocal ability withstood harsh criticism by the media and allowed him to shatter the stigma attached to the words “reality show”. A perfectionist at heart, Bisbal has always strived to perfect his craft with every presentation and recording. His desire to grow and his passion for music have brought him to collaborate with an assorted array of artists. His most notable collaborations include songs like “Hate That I Love You” with singer Rihanna, and “Aquí Estoy Yo” in which he partnered with three of the biggest names in Latin music. “Aquí Estoy Yo” featured the participation of the ever dynamic Alex Syntek and Noel Schajris from the duo sensation Sin Bandera. Originally written by Luis Fonsi, David participated in this chart toping quartet single which debuted to massive ratings at the Premios Lo Nuestro in 2009. With each studio production, David was able to grow and introduce new elements to his sound, to his stage shows and win over new fans. Always a favorite at award shows like Premios Billboard and Premios Lo Nuestro, Bisbal has always maintained a solid and direct relationship with his fans. Through forums and fan clubs around the world, David always makes time to meet with his fans, listen to their stories and bring them into his world. Recognizing that without their support he may have never gotten a start to his career, his relationship with his fans is the aspect of his career that he is most protective of and meticulously works at keeping in constant communication with. In his You Tube channel, he gives fans glimpses into life on tour with webisodes from each of his tour stops. His Facebook account is always active posting news features and contests in which fans can win meet and greet passes and other opportunities to have a one on one encounter with fellow fans and David himself. This close and honest relationship is the reason why he is one of the most followed Latin artists on Twitter with over 4 million active followers. With this acoustic tour, David is presenting one of the most honest and stripped performances he has embarked in these ten years of his career. When asked what makes this tour different from the rest, he is quick to answer that what makes this tour different is that here is where he has felt most vulnerable and intimate with his fans because it is all about celebrating the music. Una Noche promises to be just that, a night all about the emotion and power that music can have regardless of the language in which it is interpreted. Whether you are a fan from the Corazón Latino wave or began listening to him recently on the Sin Mirar Atrás album, on October 19 you will be at the Warner witnessing one of the most powerful voices in the last decade perform a night of music, memories and emotion in the voice of David Bisbal.